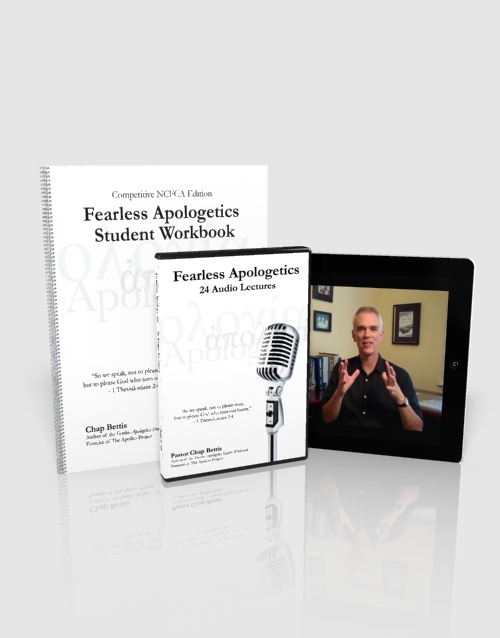 The complete package includes everything a speech student could need: the student workbook, the videos subscription, the audios to listen on the go, and our 14 lessons introductory camp. The audio lectures from the videos. These are the lectures Chap gives his students every year. Over 9 hours of teaching! Each lecture is from 18-30 minutes. If put on CDs, it would require numerous CDs and an exorbitant cost! Instead, these MP3s are on a DVD-ROM for you to load to your smart phone or music player. You get 24 lectures for less than the price of an itunes song each! For more information visit this page. Everyone needs the help that an apologetics boot camp can bring. But not everyone can attend a camp. Now you can listen to Chap's expertise right in the comfort of your own home. Perfect for beginning speech families. 14 different lessons will help you jump start the year.